This biography of Abraham Solomon comes from an old copy of the Dictionary of National Biography (see bibliography). It has been prepared for the Victorian Web by Jacqueline Banerjee, who has added the initial letter, Solomon's carte-de-visite, some paragraph breaks and links, and a short note about the current entry for this artist in the Oxford Dictionary of National Biography. olomon, Abraham (1823–1862), painter, second son of Michael Solomon, a Leghorn-hat manufacturer, by his wife Catherine, was born in Sandy Street, Bishopsgate, London, in August 1823*. His father was the first Jew to be admitted to the freedom of the city of London. Two members of the family besides Abraham became artists. A younger brother, Simeon, acquired some reputation as a pre-Raphaelite painter and pastellist; he exhibited domestic subjects at the Royal Academy from 1858 to 1872; his crayon drawings of idealised heads are still popular. A sister, Rebecca Solomon, exhibited domestic subjects at the Royal Academy and elsewhere between 1851 and 1875, and died on 20 Nov. 1886. 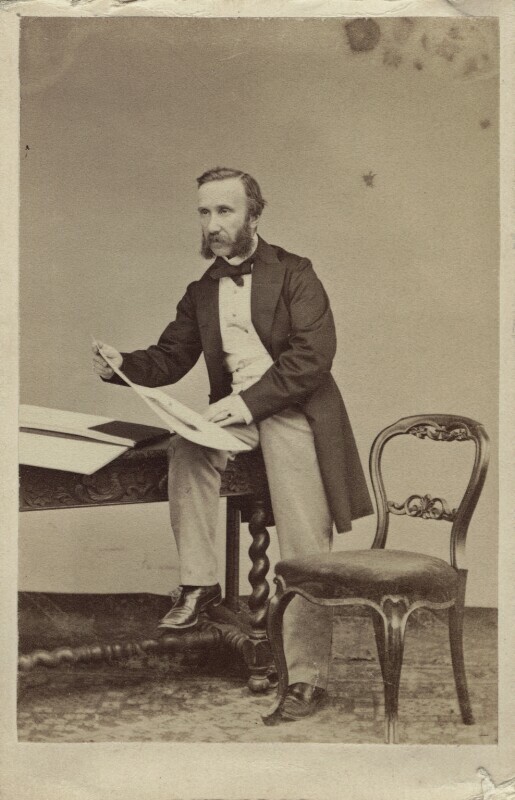 An albumen carte-de-visite by Cundall, Downes & Co, c.1862, © National Portrait Gallery, London (NPG Ax14884). Available on the Creative Commons Licence (CC BY-NC-ND 3.0). At the age of thirteen Abraham became a pupil in Sass's school of art in Bloomsbury, and in 1838 gained the Isis silver medal at the Society of Arts for a drawing from a statue. In 1839 he was admitted as a student of the Royal Academy, where he received in the same year a silver medal for drawing from the antique, and in 1843 another for drawing from the life. His first exhibited work, Rabbi expounding the Scriptures, appeared at the Society of British Artists in 1840, and in the following year he sent to the Royal Academy My Grandmother (now belonging to a cousin) and a scene from Sir Walter Scott's Fair Maid of Perth. These were followed (at the Academy) by a scene from the Vicar of Wakefield in 1842, another from Crabbe's "Parish Register" in 1843, and a third from Peveril of the Peak in 1845. The Breakfast Table, exhibited in 1846, and a further scene from the Vicar of Wakefield in 1847, attracted some attention. In 1848 appeared A Ball Room in the year 1760, and in 1849 the Academy for Instruction in the Discipline of the Fan, 1711, both of which pictures were distinguished by brilliancy of colour and careful study of costume. Too Truthful was his contribution to the exhibition of the Royal Academy in 1850, and An Awkward Position — an incident in the life of Oliver Goldsmith — to that of 1851. In 1851, also, he sent to the British Institution Scandal and La petite Dieppoise. In 1852 appeared at the Academy The Grisette and a scene from Molière's Tartuffe — the quarrel between Mariane and Valère, where Dorine interferes — and in 1853 Brunetta and Phillis, from the Spectator. In 1854, he sent to the Academy First Class: the Meeting and Second Class: the Parting. Both were engraved in mezzotint by William Henry Simmons [q.v. ], and marked a great advance in Solomon's work. They show an originality of conception and design which is not apparent in his earlier work. His next contributions to the Royal Academy were A Contrast in 1855, The Bride and Doubtful Fortune in 1856, and Waiting for the Verdict in 1857. The last picture greatly increased his popularity; but its companion, Not Guilty, exhibited in 1859, was less successful. Both are now the property of C. J. Lucas, esq., and were engraved by W. H. Simmons. The Flight, Mlle. Blaiz and The Lion in Love (also engraved by Simmons) were exhibited at the academy in 1858; Ici on rase, Brittany, and The Fox and the Grapes in 1859; "Drowned! Drowned!" in 1860; Consolation and Le Malade Imaginaire in 1861; and The Lost Found in 1862. Art Critics in Brittany appeared at the British Institution in 1861. His last work, Departure of the Diligence at Biarritz is now at the Royal Holloway College, Egham. Solomon died at Biarritz, of heart disease,* on 19 Dec. 1862. He married, on 10 May 1860, Ella, sister of Dr. Ernest Hart; she survived her husband. Although this account gives a good idea of Solomon's output, and the general course of his career, it has been found inaccurate in a few points. According to researcher Carolyn Conroy, Solomon was born in May, not August, 1823 (he certainly was not born in 1824, the year given by several other sources). In the more recent account of the artist in the online edition of the ODNB, Chloe Johnson finds that Solomon died of tuberculosis, rather than heart disease. This is very likely: he had suffered from heart problems, but the immediate cause of death, accepted by Conroy, was "inflammation of both lungs." Still looking at the events surrounding his death, Johnson claims that, by a sad irony, Solomon died on the very day that he was elected Associate of the Royal Academy. However this has been refuted by archivists at the Academy itself (see Conroy's note about this). Other facts in the present ODNB account help to round out Solomon's character a little. He was reputed to be a good-natured fellow and a great music lover, who held musical soirées at his house. Works such as Waiting for the Verdict and "Not Guilty": The Acquittal became highly popular as engravings, and were "considered superior to similar popular works because he conveyed the psychological drama, in which he incorporated his personal observations about human nature." His early death at only thirty-nine clearly cut short a promising career. Having been married for not much over eighteen months, Solomon left a young widow, but no children. Conroy, Carolyn. "Abraham Solomon (1823-1862): A Brief Biography." The Simeon Solomon Research Archive. Web. 22 March 2019. Graves, R. G. "Solomon, Abraham (1823-1862), painter." Dictionary of National Biography. Vol. LIII (Smith-Stanger). Ed. Sidney Lee. New York: Macmillan, 1898: 216-17. Internet Archive. Copy contributed by an unknown library. Web. 21 March 2019. Johnson, Chloe. "Solomon, Abraham (1823–1862), genre painter." Oxford Dictionary of National Biography. Online ed. Web. 21 March 2019.